1/3 Off Food Orders on Your Birthday with Newsletter Sign-ups at YO! Sushi Exclusions apply, please see T&Cs. Please note that this offer is not valid from 7th - 29th January 2019! YO! Sushi has been feeding hungry, adventurous folk since 1997 when its first restaurant opened up in Soho. The first UK restaurant with a kaiten conveyor belt and colour-coded dishes was a big hit, and now the chain has over 100 outlets worldwide, serving millions with its fresh, authentic meals. All YO! Sushi’s food is served the day it’s made, and much of it is prepared before your eyes in YO Sushi’s open kitchens. YO! Sushi believes that preparation is best done by hand, that’s why their fish is hand-scaled, hand-filleted, boned, trimmed and packed. 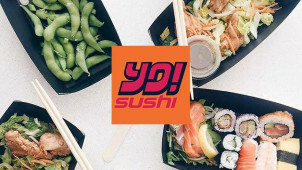 With a variety of dishes, including loads for veggies and vegans, such as sashimi, tempura, salads and yakisoba noodles, there’s a lot more to YO! Sushi than just raw fish. You can even enrol in Sushi School, and learn from the best how to roll your own dishes. But if you’d rather just be fed than do the cooking, YO! Sushi meals are great to enjoy taken-away or for a fun sit-down dinner. YO! Sushi’s offers page is jam packed full of ways to save on your sushi! Where is my nearest YO! Sushi? Check out their restaurant locator here. Does YO! Sushi do a student discount? Yes! Sign up for YO! Sushi emails and you will be asked to register a student ID if you have one. Then you can enjoy your discount! Where can I look up the YO! Sushi menu? Can I get a YO! Sushi gift card? You can! Check them out here. Delivery is available via Deliveroo or Just Eat from many YO! Sushi outlets. Order yours here! YO! Sushi is one of the nation’s favourite sushi bars, with a variety of Japanese and Asian cuisine, all served with delicious shinsen (Japanese for freshness!) from their famous conveyor belt. A Yo Sushi voucher could save you loads off your next meal, giving you fresh asian flavours for less. With gyoza dumplings, katsu curry, dragon rolls and so much more to choose from, give your tastebuds a holiday at YO! Sushi. YO! Sushi only use the finest authentic ingredients from their specialist suppliers. You may have noticed how good their soy sauce is, for instance – it’s Yamasa, Japan's favourite brand. YO! Sushi’s vegetarian miso is made by the world’s number one producer, Marukome. Its food is sustainable too – you won’t find any bluefin tuna on their conveyor belt, just yellowfin and albacore, and it has all been approved by Fish2Fork as the most sustainable in any restaurant of its size.